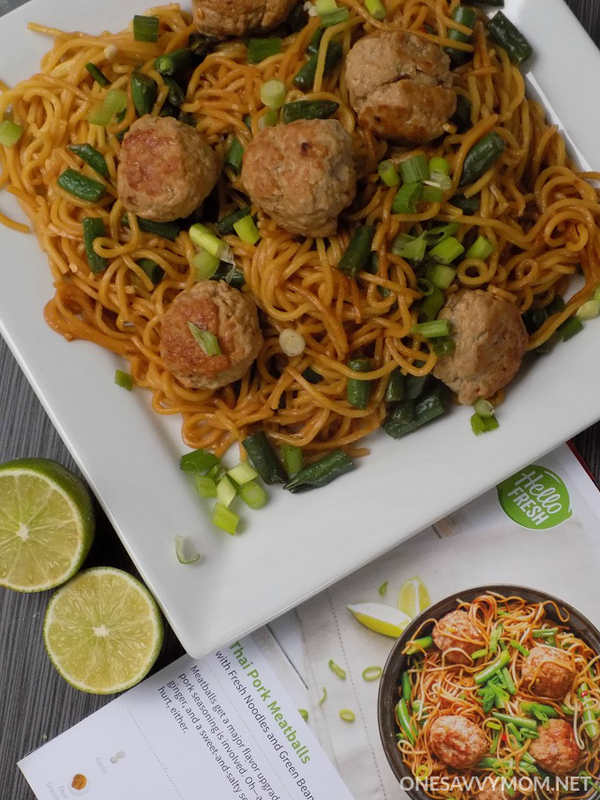 This Thai Pork Meatballs and Noodles recipe is so good, and it's so easy to make! 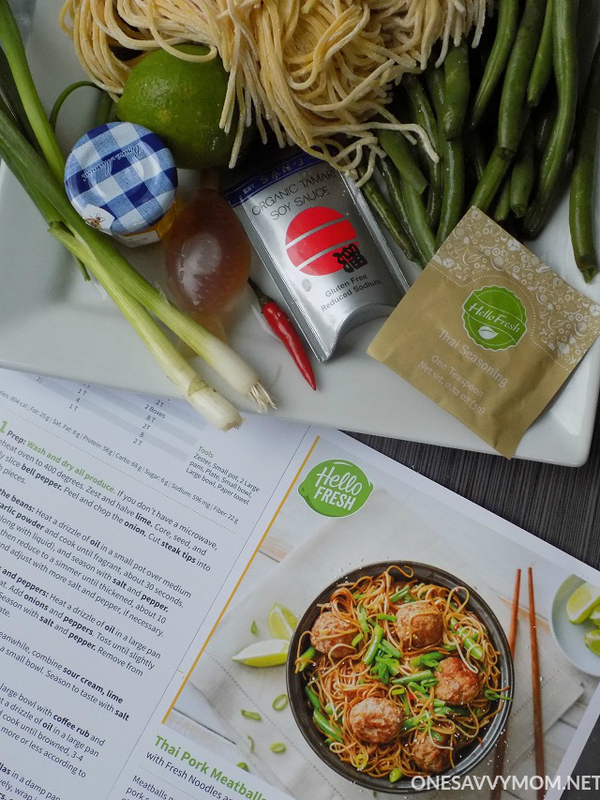 We recently had the chance to check out the HelloFresh subscription service, and it was pretty amazing. Basically, the cooler box was shipped with all of the fresh ingredients needed to make 3 new recipes, that were laid out clearly on the included recipe cards. 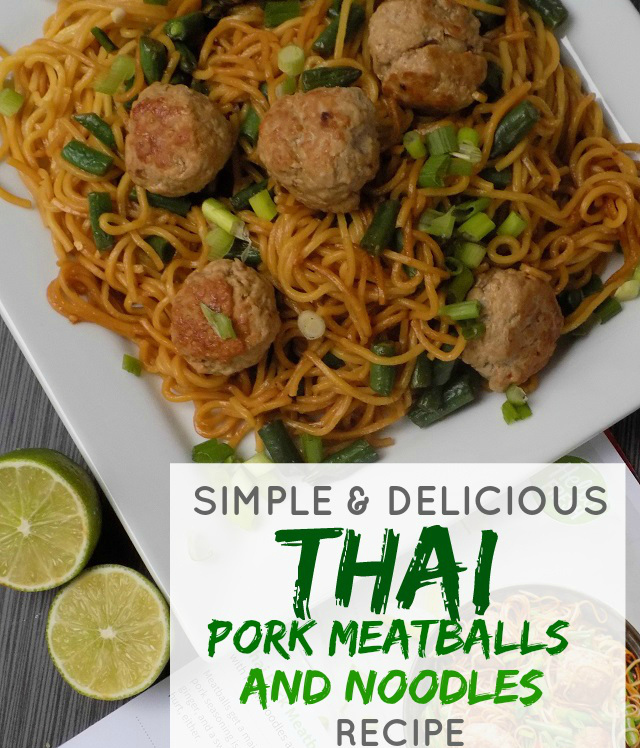 We started the week out with this simple and delicious Thai Pork Meatballs and Noodles dish, and I was pleasantly surprised by how easy it was to make. It took about 35 minutes total from prep to completion, which is totally doable for me, even on a busy day. 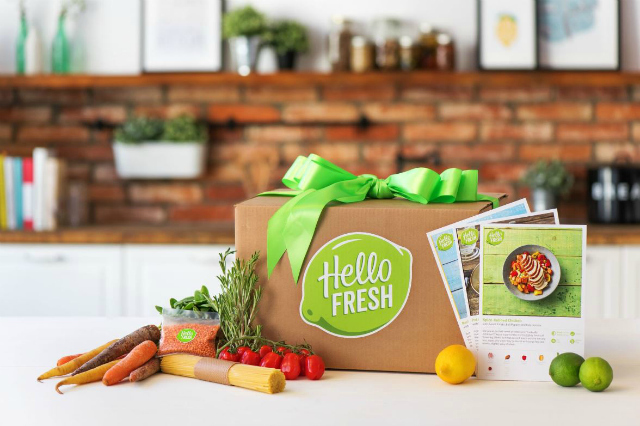 Grab the recipe and find out more about the Hello Fresh subscription service, below. This would make a great gift idea for just about everyone on your list, this holiday season! 1. Prep: Wash and dry all produce. Bring a large pot of water to a boil. Mince garlic. Finely chop chili, removing seeds if you prefer less heat. Thinly slice scallions, keeping greens and whites separate. Trim and cut green beans into 1 inch pieces. Halve the lime. 2. Form the meatballs: In a medium bowl, mix together pork, scallion whites, Thai seasoning, half the garlic, and a large pinch of salt and pepper. Form into 1 inc meatballs. 3. Cook the meatballs: Heat a drizzle of oil in a large pan over medium-high heat. Add meatballs and brown 1-2 minutes per side. Add 1/4 cup water to pan, cover with a large lid, and steam 2-3 minutes (to cook meatballs through). Uncover and simmer on low until water evaporates. Remove meatballs from pan and set aside on a plate. 4. Cook the green beans: Heat another drizzle of oil in same pan over medium-high heat. Add green beans and toss until crisp-tender, 3-4 minutes. Season with salt and pepper. Remove from pan and set aside. TIP: Add a few Tablespoons of water to speed up the process. 5. Cook the noodles: Add the noodles to the boiling water, stir 2-3 minutes until tender, yet chewy. Drain and rinse under cold water. Add chili and remaining garlic. Cook until fragrant, about 30 seconds. Add noodles and stir until broken up completely. 6. Toss and serve: Combine soy sauce, honey, sesame oil, and 1/4 cup of water in a small bowl. Heat another drizzle of oil in the same pan over medium heat. Add meatballs, green beans, and soy mixture to pan. Toss until thoroughly combined and sauce has thickened, 1-2 minutes. Top with scallion greens and a squeeze of lime. Enjoy! We absolutely loved this meal, and the other two that were included in our shipment. We also had recipes and ingredients included in our delivery for Coffee Rubbed Steak Tacos, and Chicken Paillard with Chimichurri, Sweet Potato wedges and salad. All 3 recipes were amazing! I love that this convenient service allows us the opportunity to explore new recipes that we otherwise may not try, and that it is all so fresh and simple. I don't have to meal-plan or take excessive trips to the market; which is a great time-saver for busy moms, like myself. I also absolutely LOVE that this service helps to eliminate waste too, as they send only what is needed for each recipe. A HelloFresh gift card for a "classic" box or a "veggie" box would make a great gift idea this holiday season, for just about everyone on your list. Moms, dads, new parents, newlyweds, college students - EVERYONE! HelloFresh delivers tasty recipes and ingredients every week right to your door, so all you need to is cook and enjoy! 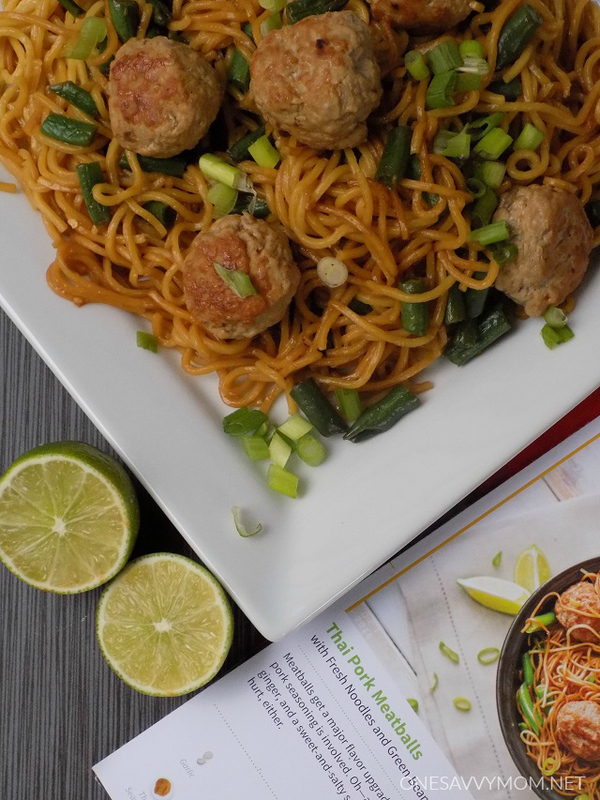 HelloFresh provides the opportunity to enjoy healthy home-cooked meals without the hassle! Eliminating the need to plan or shop, HelloFresh delivers delicious and satisfying meals that are easy and fun to make in 30 minutes. The recipes are also reviewed by an in-house dietitian to make sure you're receiving a well-balanced and nutritious meal. The benefits of cooking at home are endless, from building healthy eating habits to bonding over creating a meal together. A gift from HelloFresh is more than a meal, it's a delicious experience! *Disclosure: Our thanks to HelloFresh for providing a classic box delivery for review/feature purposes. All thoughts and opinions expressed are our own. I learned I can get $15 off my first delivery when I subscribe to their newsletter. Thanks for mentioning that! :) Pretty great deal - definitely worth a try! We absolutely adore this service - it allows us to explore so many fun new recipes each week. Wow that is a great deal for subscribing to their newsletter. I would love to have this service is sounds great and fun to explore new recipes. This sounds like a great idea. This recipe looks really good. My family would like this.